In Part I of this interview with Bentley Christie, he talked about his flagship website redwormcomposting.com and how a little innovation helped his physical business in an unexpected way. Part II is all about the Worm Farming Alliance, the group Bentley founded to provide collaboration and knowledge sharing to vermiculturists and vermicomposters who have moved – or want to move – beyond beginner status to a more advanced or commercial scale. As a proud WFA member, I am proud to be part of such a selfless group of people and am always entertained by the personalities within it. I’ll save any further pontificating for the end! For now, enjoy Part II with Bentley! UWC: Can you give us the history behind WFA? And what was your motivation to start it? Another aspect of the worm farming industry that has always bothered me is the dark cloud that seems to follow us even to this day, thanks to all the worm farming scams, especially back in the 70’s and early 80’s. There are still a lot of people who associate the word “scam” with worm farming or at a bare minimum, don’t really take it seriously – assuming it is reserved only for those people on the fringe of normal society. I felt that it would be hugely valuable to create a resource that not only brings together worm farmers and helps them succeed, but also to hopefully help improve the overall reputation of the industry. Since I had a strong background in vermicomposting, worm business, and website creation/promotion by that point, the online membership approach seemed to make the most sense. I’m not going to say it’s been “easy” – or that it has been a raging success ever since I launched it back in early 2011 (Sidenote: technically, the WFA was a follow-up to my original “Inner Circle” group, which was launched in late fall of 2009). There have been plenty of periods where I have wondered what on earth I was doing, and why I was bothering. But I’m happy to report that things have really been coming together for the group in the last year or so. UWC: For any new members or anyone else wondering if WFA is for them, what are the keys to getting the most out of their membership? BC: The overall strength and success of the membership has been largely dependent on the involvement of its members. The WFA community is absolutely at the heart of this resource – and it’s when a lot of members are participating, sharing, helping one another, that things tend to really take off. So my number one recommendation would be to get involved. Sadly, people often assume that they have nothing to contribute just because they are a “newbie.” This couldn’t be further from the truth. We welcome questions/comments from people with ALL levels of experience. I know it’s a bit cliché, but there truly is no such thing as a “dumb question” in our group. Something that goes hand in hand with being an active WFA community member these days is also being a Facebook user, since our private Facebook group has definitely become our main communication hub. I know there are still a lot of people who don’t like Facebook, don’t use it, etc. I totally understand, and have some of the same feelings about it – especially for family/friends stuff – but I STRONGLY urge everyone to put those feelings aside and really give it a chance. You can easily create a separate user account (some of our members even use pen names) and use it solely for the WFA group (and maybe some other interesting ones once you get comfortable with it). The WFA group is what’s known as a “secret group” – so non-members can’t even access the front page, let alone read any of the posts inside. So privacy is definitely not an issue. Another important recommendation is for people to REALLY get to know the resource. I spent a ton of time this past winter putting together a WFA User Guide specifically so people would know exactly what is included with the membership. Finally, don’t be a stranger! There is a special place in my heart for WFAers ,so I welcome any and all e-mails and Facebook chat messages. If there is something on your mind, if you need assistance with something, I WILL make time for you! I even have a special address that sends emails to my mobile phone. If new members focus on these 3 things, I can pretty much guarantee they will get a lot out of the membership! UWC: Any new developments on the horizon? BC: One of the challenges with this project has been getting new resources out the door, so there are ALWAYS lots of things “on the horizon” – often for a lot longer than I’d prefer! I guess this is the curse of having so many things on the go. Griping aside, one area that definitely needs more attention is the topic of website creation. It’s such a scary idea for so many people, yet SO important for any entrepreneur in this day and age. And the good news is that it’s not nearly as challenging/expensive as many assume. So, I definitely want to revamp my website-building training, both inside the WFA and in the form of separate resources. Something else that seems to be a “mystic art” to most people is info product creation and promotion. The majority of our business-owning members have physical products – worms, worm castings, etc – as their primary focus. This is great, but what I want people to realize is that digital products can be a fantastic way to boost income (even greatly helping with physical product sales), and just generally, build their brand. Apart from more training on this topic, I also have a couple of smaller products (work-in-progress) that members will be able to sell and keep most of the revenue from. I think it’s the actual creation of these products that is the main hurdle for most people, so I’m hoping to make it easy for members to test the waters and to get a taste for the possibilities! UWC: Amen to all of that! The digital product lightbulb came on for me when I realized that the cost of making one copy of a digital product cost the same as making a million copies! And that’s when I developed the Urban Worm Calculator and began promoting WFA as an affiliate, which has been very nice. So, who are some of the most influential Worm Farming Alliance members? And who has really emerged over the years? BC: There are a LOT of WFAers that have really impressed me and who have played an important role in the community. The first person who comes to mind is George Mingin. His level of contribution to the WFA has been nothing short of amazing. As soon as he joined, he became very active in the community forum, sharing his wealth of knowledge, patiently answering question after question. He is almost certainly one of the largest worm suppliers in Australia, yet he is very humble, and truly believes that everyone has something to offer. Heather Rinaldi is definitely another person who quickly comes to mind. She was just getting started when she joined the “Inner Circle” group (mentioned earlier) – and what she has accomplished in the years since then is incredible! We lost touch with her a bit once we transitioned from Inner Circle to WFA, but when the WFA Facebook group was launched I added her to it and she has become a very active (and important) member of the WFA community. Needless to say, there are many, many other important/prominent members – far too many to discuss here unfortunately. Before moving on, though, I DO at least want to make mention of my awesome admins, Larry Shier and Brian Donaldson. These guys have played a huge role in the success of the WFA Facebook group (and the RWC Facebook group for that matter), and the overall improvement of the membership during the past year. They have tirelessly fielded questions, shared their knowledge and just generally helped members get more out of the WFA. UWC: Do you see any up and comers in WFA you would like to mention? You are definitely someone I consider a serious “up and comer” (for that matter – you have already “arrived” in a lot of ways) – and I can’t wait to see where you go from here! At the risk of kissing up (lol) – I think you’ve been an especially interesting case since you seem to share the same passion for online promotion as myself – and you have really used that to your advantage. Gavin Ciccia of Jersey Worms (who we’ll talk about in the next question) is certainly someone to watch as well – but for different reasons. I can definitely see him developing a very sizable physical business over the next 5-10 years, considering all that he accomplished before graduating high school! Kristin and Anthony Beigay of Earthen Organics have also really impressed me – I’ve really loved watching them gradually build up their castings business, and I see a very bright future for them. Keith Reber is an interesting case as well. Not really an “up and comer” as far as vermicomposting goes, but still worth mentioning here. He has been very generous with his “follow-along” posts in the group, taking us along on his journey as he built his professional-grade flow-through bed, and now works towards developing his business! Once again – I feel guilty because there are so many people that deserve to get mentioned here! I am also loving the engagement of experts like David Murphy and George Mingin on the WFA Facebook Group as well as the dual-threat good/bad cop group moderation of Larry Shier and Brian Donaldson. Can you speak to the strengths they bring? I’ve talked about George earlier, so it’s no secret that his contribution has blown me away. He is SO incredibly busy, yet he continues to make time for the WFA community. And any time he posts something, you can almost hear the hush as every member stops to read what he has written! David Murphy was added as an honorary member, and I have really appreciated his level of participation and the wealth of knowledge he brings to the table. I also love that he enjoys a good debate – so conversations he is involved in are almost always more interesting and educational. Again, Larry and Brian have been hugely important for many reasons – but their talents for helping discussions along are unparalleled, and as you alluded to, they definitely have an interesting dynamic when getting involved in the same threads. Pauly Piccirillo of Worm Farming Revealed is another honorary member I can’t say enough good things about. It is always great (often entertaining) when he gets gets involved in our discussions. He has a wealth of knowledge and is one of the nicest guys you’ll ever meet. And yes…wait for it…once again there are many other important contributors that could be mentioned here! UWC: When it comes to marketing, what does the vermiculture and vermicomposting community do well? Something I’ve been very impressed with (primarily based on info shared by WFA members) is the amount of “real world”, “pavement pounding” effort a lot of vermi-entrepreneurs seem to put in. Networking, giving presentations, setting up booths at shows, getting their packaging, etc designed. I think this is fantastic for helping their business along, especially in cases where their primary target market is local. UWC: Yep! What do you wish it did better? I definitely wish worm-heads were, on average, a lot more comfortable with online marketing. Yes, obviously there are a fair number of people – you being a prime example – who are making good progress online. But overall, this seems to something a lot of vermi-entrepreneurs tend not to put enough focus on. More and more worm farmers are creating a website (or at least having one created) for their business – and this is a great step in the right direction – but many seem to assume that this is where their online work ends. And when a stampede of eager customers don’t show up to order from the site, they assume it must have something to do with a need for more SEO (search engine optimization). I encourage people to think more in terms of overall online “platform” vs simple static website. Not only is it hugely valuable to have dynamic elements on your site (eg. blogs, twitter/facebook/pinterest/instagram, etc feeds), but everyone should be making an effort to build some form of e-mail list, and to spread their influence beyond the confines of their website. It is easy to get carried away with all the various “cool” social media platforms these days – and I would caution most people to limit their involvement to only those platforms that make sense for what they are trying to do – but if you dedicate the time to building your presence on a small selection of these platforms it can have a significant impact on the overall success of your business. I find that a lot of people think solely in terms of offering high-quality products and services to customers, not in terms of building and serving a much larger audience. Again, don’t get me wrong – quality products and service is a lot more than some business owners offer – but I feel you are limiting your growth potential if you just stop there. When you really spend the time learning about the passions, frustrations, goals etc of the people in your target market, and then find ways to serve their needs (most often via some form of education) it can work wonders for your brand. Just look at Patrick Cartwright Jr of Red Worms Express and his Vermicomposting – Worm Farming Facebook group, which has close to 15,000 members as I type this! 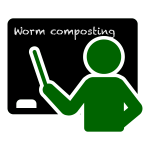 Patrick saw an opportunity to help a lot of people learn more about vermicomposting and worm farming, at a time when really good online groups were in short supply. Unlike a platform like Ning (used for the excellent “Vermicomposters” forum), Facebook offers much more of a live, conversational feel – something that appeals to a lot of people. Has this group helped Patrick to build his business? You betcha – but the KEY here is that he started by offering huge VALUE, with zero strings attached (and continues to do so). These days it’s the folks that follow this model (VALUE before business) that tend to have the greatest success online (and in general). UWC: I’m going to phrase this question in the form of a statement! I want to give a shout out to WFA member Gavin Ciccia AND the members providing him mentorship. Gavin is a barely out-of-high-school kid who is putting extra money in his pocket through both sales of worms and vermicompost and is out in his community educating gardeners about the wonders of worm poop. He started off with tons of energy, but inconsistent direction. I honestly thought he would flame out. But through the gentle nudges from, ahem, more “distinguished” members, I’ve watched Gavin mature and exercise his entrepreneurial muscles at a very early age and now he’s got a real brand going in Jersey Worms. Are you willing to accept credit for the organization that has facilitated his success? BC: From day one I’ve known that the real strength and potential of the WFA would lie in its members, and specifically in their involvement. Sure, I came up with the idea, launched the WFA, and have played “host” – but the vast majority of the credit for the success of many WFA members should go to the community as a whole – and of course, to the individual themselves. If there’s one thing I’ve learned over the years from interacting with countless vermi-entrepreneurs it’s that there are certain traits that go hand in hand with success. Not to throw Gavin under the bus here – lol – but like yourself, I really wasn’t sure what to make of him early on. I think part of the problem is that I kept forgetting just how young he was. I had enough difficulty relating to my peers when I was his age, so trying to relate to one now that I’m into my 40’s, has been even more of a challenge. Bottom line, I was happy to see him make a go of his little worm business while in his teens (impressive enough in its own right), but I honestly didn’t think he was taking it seriously enough to make it into a successful long-term venture. Well, I must say that my impression has completely changed over the past few months – that’s for sure! One of Gavin’s major strengths in my humble opinion, apart from a solid work ethic, is that he doesn’t let anything bog him down. He’s definitely not someone who suffers from “analysis paralysis” and self doubt (two things that have had a negative impact on my own progress). Even when it comes to taking advice from experienced WFAers – I appreciate that Gavin has a strong enough sense of direction to know what advice to ignore and what advice to take. Maybe he doesn’t “get it right” every single time – but he keep bulldozing ahead…learning and growing as he goes. I see great things in this young man’s future, that’s for sure! And it’s great to have him as a member of the WFA. While I love what Bentley described about the Worm Farming Alliance, I really love what he didn’t say: that membership is a silver bullet, the key to untold vermi-riches, or the one thing you need to be successful. Something tells me Heather Rinaldi of the Texas Worm Ranch didn’t pay her dues and just watch the money start rolling in.! WFA membership offers, especially in the Facebook group, nearly instantaneous answers to some pretty difficult questions from the biological level to the marketing side of things. It’s hugely invaluable, but there are two things to realize before you commit to WFA. You don’t get the answers if you don’t ask the questions. Especially in the case of vermicomposting, public consciousness of its benefits is so low that it’s not just a matter of “finding” the market. It literally has to be created by appearing at farmers’ markets, speaking with gardening clubs, and doing the “pavement pounding” that Bentley described. WFAers like Mary Ann Smith of Valley View Farms, and the Beigays of Earthen Organics are very good at this and Cristy Christie of Black Diamond Vermicompost told me she has to grow to meet the demand of the market she educated. What a great problem! But Bentley alluded to the fact that for all of the success WFA members enjoy in the physical realm – you know, selling the actual worms and worm poop – that he feels many of them are leaving money on the table by not expanding their online presence. So in Part III, Bentley and I are going to geek out a bit on how best to create an online presence and leverage the web to help supplement the physical business. We’ll discuss a wide range of topics like e-mail list building, persistence, and just simply being helpful, but we’re going to stress two topics that WFA members in particular ought to consider, especially if their business isn’t generating the revenue they’d like. I can’t wait to cover these two issues because they are such low-hanging fruit for a business to pick! A quick word about information or digital products. They can take awhile to produce and require some writing and design chops, though not as much as you think! But the time spent to create them can be significant and once they are created, you have to have a way to let people know about them! But local SEO is far simpler and can have nearly immediate benefits. So we’ll cover some of the ways physical business owners can use the web to supplement their income and add a boost to their physical business. Don’t miss that one!